(ANAHEIM, CA) -- Multi-platinum rock band Stryper is taking Stryper Fan Weekend to the West Coast this year. The popular fan event will take place September 10-13, 2015 in Anaheim, packed with exciting events, special guests and more fan access than ever before. Stryper Fan Weekend will provide fans with the opportunity to go back in time to Southern California – the place where it all began for the band. A number of once-in-a-lifetime events are being planned, including a wide variety of special guests. For the first time, Stryper will bring together some of the people who helped shape their career, and fans will have the opportunity to meet and interact with both current and former managers, road pastors and other band personnel. The 4-day fan event will include VIP treatment for Stryper LIVE at the House of Blues (Anaheim), Q&A sessions with the band and special guests, interactive events with the band, an exclusive commemorative laminate, a professional photo with band (printed and personally autographed) and more surprises and exciting moments to be announced! While fans have come to know Stryper Fan Weekend as an annual event, 2015 will mark the final event for the foreseeable future. Due to heavy touring, recordings schedules and other project commitments for the individual band members, 2015 is scheduled to be the final “annual” event. Stryper will continue to offer their popular Meet & Greets throughout the 2016 tour and beyond. Stryper Fan Weekend is on sale now and space is extremely limited. For more information or to register, visit http://www.stryper.com/News/fanweekend2015.html. The band’s all-new studio album, Fallen, will be available in North America on October 16th via Frontiers Records. Fallen is available for pre-order via digital retailers and can be ordered via iTunes at http://radi.al/StryperFalleniTunes and via AmazonMP3 at http://radi.al/StryperFallenAmazon. It is also available in various physical configurations at www.stryper.com/fallen. Stryper is one of the top Christian rock bands of all time. Comprised of the original line-up, Stryper has been rocking since 1984, and is responsible for such '80s metal classic albums as Soldiers Under Command, To Hell With The Devil and In God We Trust. In fact, Stryper is the first band to ever have two songs in MTV’s Top 10 simultaneously with their hits “Free” and “Honestly.” After a sabbatical for much of the 1990's, Stryper returned strong in the early 21st century. To date, the Dove Award-winning and GRAMMY nominated band has sold upwards of 10 million records worldwide. Their last studio album No More Hell To Pay debuted in the Top 40 of the Billboard Top 200 landing at #35. For more information, visit www.stryper.com. 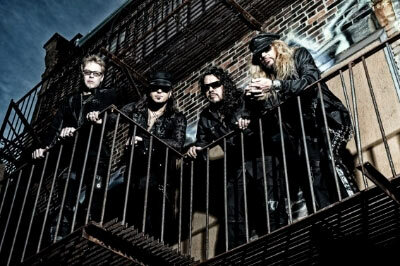 For more info on Stryper visit the JFH Artists Database.